Brute forcing SMTP credentials is hardly new. But I have seen a couple of odd patterns lately in one of my mail servers, and was wondering if anybody has any insight into these patterns. For this diary, I am using logs starting May 31st until today. First, the overall patterns shows very strong spikes with 2000-3000 attempts per hour. 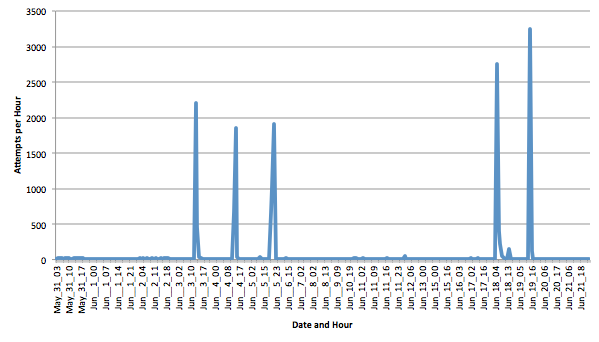 These "spikes" usually come from many different IP addresses, so they are likely caused by a botnet probing my system. The last spike on June 19th was caused by about 400 different IP addresses (I am running fail2ban, and they are blocked after a couple of attempts). The part that is of some concern is that a couple of the users are actual users of the server. The "ranking" goes somewhat by the amount of e-mail created by the user in general, so it is possible that spamers do try usernames they already have in their database against mail servers used by their domain. I don't capture passwords, but the number of attempts for most of the usernames is small, so I assume only a couple of passwords are used. The first and third name are odd as they look "random". Could they be used to detect if the mail server responds differently for users that do not exist? know if this is the same attack. Huge peaks of attempts then temporary blacklisted by my OSSEC and starting again and again. Most bots only support plain text brute-force. We disabled plain text authentication on port 25, and some bots still attempt to login without STARTTLS. Now we disable AUTH LOGIN; and the attempts have dropped by quite a bit. We do get some attempts via SMTPS on port 465; but the frequency is not as high. I'm blocking somewhere around 75% of IPv4 IP space on my SMTP server, so I'm not seeing stuff like this any more. If I recall, the last time I saw this, the remote machine generating the destination addresses was creating them but using the rDNS of my server's IP address as the email address. For example, if my ISP is "acme.com", and the rDNS of my static IP is random-stuff.acme.com, then I was being hit with mail being addressed to what-ever@random-stuff.acme.com. I've been hit with pop3 login floods in the past, and have published the list of user names to alt.spam and news.admin.net-abuse.email. So now I have my router take inbound port 109 and route that to my mail server internally on port 110 and all external mail clients perform pop3 logins remotely on port 109. No more pop3 login floods.